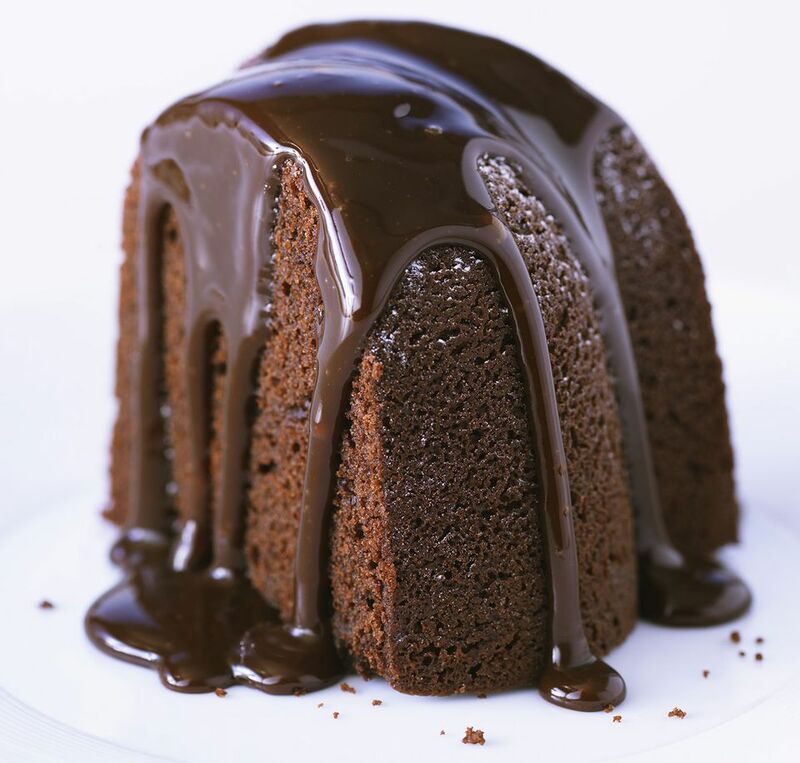 Bake this moist, delicious chocolate cake in a bundt cake pan or tube pan. This is an excellent cake to make for guests or to take along to a potluck or family event. Drizzle the easy chocolate glaze over this cake, or use your own favorite glaze on the cake. A mocha or orange glaze would be delicious choices as well, if you're feeling indulgent. However, a vanilla glaze works perfectly well if you're in the mood for something with a bit simpler of a flavor. Or simply dust the cake with sifted powdered sugar and serve with berries or warm preserves. Note: while there are multiple steps to this recipe, this bundt cake is broken down into workable categories to help you better plan for preparation and baking. Heat the oven to 350 F/180 C/Gas 4. Generously grease and flour a 12-cup Bundt cake pan or similar tube cake pan. In a bowl, combine the flour, cocoa, baking soda, and salt. Mix well to blend thoroughly. In a large mixing bowl, cream the 1/2 cup of butter and the granulated sugar until light and fluffy. Beat the eggs and egg whites into the creamed mixture and then beat in the 1 tablespoon of vanilla. In a small bowl or cup, combine the coffee and milk. Beat about one-third of the cocoa and flour mixture into the creamed mixture. Then beat in half of the coffee and milk mixture. Repeat with another one-third of the flour mixture and the remaining coffee and milk mixture. Add the remaining one-third of the flour mixture and beat until well blended. Bake in the preheated oven for 40 to 50 minutes or until a toothpick or wood skewer comes out clean when inserted in the cake. Then invert onto the rack to cool completely. Drizzle the optional glaze (below) over the cake or dust with sifted powdered sugar. In a bowl or pan over simmering water, combine the semisweet chocolate, unsweetened chocolate, and the 2 tablespoons of butter. Stir until the mixture is melted and smooth. Remove from the heat and beat in the powdered sugar, boiling water, a pinch of salt, and 1/2 teaspoon of vanilla. Because Bundt cakes and tube cakes are deep, use longer bamboo or wooden skewers to test for doneness.